The recent public discussion about income inequality seems to have touched a nerve with some of our readers. I've received more than the usual share of letters complaining about the high cost of certain audio products. These correspondents don't just want to see more coverage from TAS of affordable equipment; they also object in principle to the very existence of ultra-high-end gear. A good example is reader response to my report on the Meridian Signature Reference audio system in the 2014 Range Rover, published on theabsolutesound.com and in this issue. 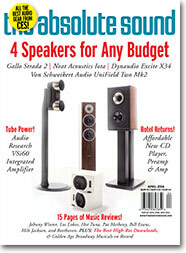 "Audio magazines should stop pandering to obscenities such as this," one reader replied. "Stop the insanity," wrote another. A third said: "I'm just tired of seeing articles reviewing pieces of gear that cost more than the average American salary. If audio companies want to make products for exorbitant costs ‘just because they can,' it does not mean that you have promote them by writing about those products. How about focusing on gear that most can aspire too, instead of only the 1%?" I reiterated in my blog response something I've written repeatedly in these pages; high-end audio encompasses a huge price spectrum, and The Absolute Sound covers the gamut. From the $149 AudioQuestDragonFly V1.2 to the $200,000 Constellation Audio Altair and Hercules, we offer our insight and opinion. You may find it interesting that when we plan the tables of contents for future issues I always include each product's price. I do this to ensure that every issue has a wide mix of price points—from entry-level to stratospheric. Take a look through last issue's Editors' Choice Awards and you'll discover our coverage of that entire spectrum writ large. The objection, however, isn't that we don't review enough affordable gear; it's that we write about super-esoteric products at all — products aimed at the so-called "1%." Some readers would prefer that we simply ignore such cutting-edge designs because they don't conform to their sense of value and equity. And look at the vitriol: "pandering to obscenities," and "stop the insanity." But I have news for these readers; it's the strong demand for reference-class products that sustains the high-end-audio industry and makes it possible for consumers to own affordable, terrific-sounding systems. The "1%" end up funding the R&D for cutting-edge technologies — technologies that find their way into affordable products over time. Do you think that the stunningly high price-to-performance ratio in today's entry-level and mid-priced products would have been possible if the high end had confined its ambitions to heavily price-constrained designs? But there's also a deeper issue here. Man has an innate drive to seek perfection, exemplified by the individuals in our industry who have devoted their lives to pursuing the state of the art in music reproduction. They push the envelope of what's possible, and it's just not in their nature to settle for compromise. That's what makes the high end the high end. It also just so happens that there are music lovers — the reviled "1%" — who appreciate these efforts and have the means to acquire cutting-edge products. Personally, I think the world is a better place because of the existence of the $108,000 dCS Vivaldi digital playback system and the $185,00Magico Q7 — and the customers who buy them. Perhaps these disgruntled readers would prefer to live in a world in which high-end designers with the inspiration and technical chops to create the state of the art decided not to realize their visions. Or one in which the wealthy didn't spend money on high-end audio. Rather than resenting those who are able to afford such products, we should all celebrate the technical and sonic achievement those products represent. The strength of the ultra-high-end audio market is a win-win for everyone. The state of the art advances, the well-heeled music lover enjoys music reproduction at its finest, an entire industry that is a force for good in the world is sustained and made healthier, American jobs are created (as are jobs world-wide), and the cutting-edge technology developed for mega-priced gear informs the development of lower-priced products — to everyone's benefit.